Last time we discussed the basics of weight loss and maintaining a healthy and active lifestyle. This week, I want to go a little deeper into exercise. As mentioned before, doing cardio is good for your body as well as getting a jump start on weight loss. The real key to fat loss though, is to build lean muscle. I’m not talking body builder muscle, but a decent amount of muscle that is strong and appropriate for your body type to support your metabolism as well as your daily activities. Muscle is what promotes a faster resting metabolism (meaning, it helps you burn calories even while you are not doing any physical activity). So… how do we build muscle? There are a few different ways to build muscle that I am going to cover. First, there are body resistance training exercises. These are my favorite, because they require essentially no workout equipment due to you using your body to build upon itself. Secondly, there are machine resistance training exercises. The amount of equipment required can vary here. From using resistance bands, to exercise machines that hyper-isolate one muscle group and build on contractions (pushing your muscles out, then stretching, and back again). Here is a guide that shows you variations with resistance bands. And lastly, another one of my favorite, are the free weight exercises. These are basically resistance training but I like to include them in their own category because they do such a great job at helping improve stability and target certain muscle groups while helping tone other areas of your body through stabilization. Here is a beginners guide for utilizing weight machines as well as free-weights. I recognize that a lot of people who might be reading this may be thinking at this point, “but what if I can’t do any of these exercises due to an injury, or general immobility?” Don’t worry, you can still build muscle! It may take a little longer, but there are some great ways to modify workouts so that anyone can participate. Instructions: It is advised that adults get approx. 30 minutes of exercise each day. Find which exercises below work best for you or are the most enjoyable and rotate between them as needed for 30 minute intervals. Be sure to include at least one rest day in your routine if you are new to exercise. Sit tall and place paper plates under each foot. Push onto the right plate and slide the foot forward. Slide the foot back, pressing onto the plate to activate the hamstrings while sliding the left foot forward. Continue alternating for 16 reps (one rep includes both right and left slides). Sit tall in the chair and tie a band around the mid-thighs. Step the right foot out to the side, touch lightly and then bring it back in, focusing on the outer thigh. Repeat, stepping out with the left foot and repeat for a total of 16 reps (one rep includes both the right and left taps). Sit tall with feet flat on the floor and knees together. Squeeze the quads (upper thigh) to straighten the right leg, foot flexed. Bend the knee to lower the foot, lightly touching the floor. Repeat for 20 reps and switch sides. Add ankle weights for more intensity if desired. Place a medicine ball (or a medium sized ball of choice) in front of you and sit tall with the abs engaged. Lift the right foot and tap the toes on top of the medicine ball. Take it back down and tap with the left foot. Continue tapping the ball, alternating feet, as fast as you can repeating for 16-20 reps. While seated with tall posture, place a ball between your knees. Squeeze the ball by contracting (pulling in) the inner thighs and release slightly–don’t release all the way–and repeat for 16 reps. While sitting tall, hold a medium-tension band in both hands up above and slightly in front of your head. The distance between your hands will determine the intensity of the exercise (closer together is harder, further apart is easier). Contract the back and pull the right elbow down toward the ribcage. Release and repeat for 16 reps before switching sides. Sit on a chair, back straight and abs in. Hold a medicine ball (or any other type of medium sized ball) at chest level and squeeze the ball to contract the chest. While continuing to squeeze the ball, slowly push the ball out in front of you at chest level until elbows are almost straight. Continuing the pressure with your hands, bend the elbows and pull the ball back to chest. Repeat for 16 reps. Sit with a tall posture holding 2-5lb dumbbells (or 16oz water bottles) at your sides. Keeping the elbows slightly bent and wrists straight, lift the arms up to shoulder level (palms face the floor). Lower back down and repeat for 16 reps. Sit with tall posture holding 2-5lb dumbbells (or 16oz water bottles) in both hands. Begin the move with arms bent to 90 degrees, weights next to the ears (arms should look like a goal post). Press the weights overhead and lower back down, repeating for 16 reps. Sit and hold 2-5lb dumbbells (or 16oz water bottles). Curl the weight up toward your shoulder and release. Avoid swinging the weights and keep the abs engaged. Repeat for 16 reps. Sit tall, holding a 5-8lb dumbbell (or an equally heavy object) in front of your chest. Keeping the abs contracted, rotate the torso to the right while keeping the hips and legs facing forward. Contract abs to bring the weight back to center and then rotate to the left. Repeat for 12 reps.
Hopefully after reading this, you have been able to think of a few ways that you will be able to implement strength training into your daily routine. Play around with these guides and even create your own fun way to get active, while building muscle, by exploring different sports or activities such as hiking. The most important part of exercise, is that you are enjoying it and doing it to better your body and mind rather than seeing as a chore because you “need” to lose weight. Rethinking physical activity is the start to a healthier, happier life. Post cessation weight gain can cause a lot of stress for most people. You don’t want to put on 10-15 extra pounds, especially if that will put you in the overweight or obese category. That’s completely understandable, and there are small changes you can make in order to achieve and maintain a healthy weight but most importantly a healthy and active lifestyle. First, I do want to address the fear of gaining weight while quitting smoking. If you are concerned about the health implications of gaining weight, know that putting on a temporary 10-15 pounds is far healthier than continuing to smoke or use tobacco. This is something I touch on with my clients who bring up weight as a major concern or trigger in their reduction/quit journey. I also like to let clients know that the upside to quitting is that even when you do gain a few pounds, your body is continuing to detox and rebuild its cellular processes post smoking cessation. This means that you will be able to more efficiently burn fat and put on healthy amounts of muscle because you are no longer doing continuous damage to your organs (which must function optimally to lose the RIGHT kind of weight). With my background in nutrition and weight loss coaching, I understand that this can feel like an uphill battle oftentimes, but rest assured that all you need is patience and dedication and there is no reason that you won’t be able to prevent or remedy weight gain after quitting. The best thing you are doing for your physical health and appearance is quitting smoking. Let’s face it, it’s hard to be fit and also a smoker- something to keep in mind. Okay, so HOW exactly do you manage your weight? Now let’s get into the details: how do you lose weight or even prevent the weight gain altogether? This is going to be a multi-part blog series, because there is no one magic secret that is going to do the trick. Tons of things factor into weight and how you gain and lose it, and it takes a long time for both to happen. In America especially, we get so caught up in the “immediate results, immediate gratification” mindset that we don’t step back and take a look at the whole picture. These are the most well-known components to a healthy weight and lifestyle, yet most people are still not eating the right types of foods and either not exercising enough or exercising too much. A healthy diet includes a diet consisting of healthy fats, proteins and vegetables and a moderate amount of complex carbohydrates, such as the Mediterranean diet. The Mayo Clinic offers a great, easy to follow guide here. One of the most important things that you can do for yourself regarding weight loss or maintaining a healthy weight is to eliminate as much processed food from your diet as possible. This includes chips, donuts, cereal, etc. This doesn’t mean that you can never eat these types of foods, but it’s encouraged to limit these to a “once in a blue moon” snack and not a daily (or even weekly) item to have. Now it’s time to touch on physical activity. You should strive to get 20-30 minutes of exercise each day at minimum. These guidelines are from the American Heart Association. This includes walking, so don’t let yourself get discouraged if you don’t have time (or the strength) to hit the weights every day. If you work, try to get up every hour or so to do a lap around your building. Take the long way to the restroom. Even park farther away (or, if you utilize public transportation and live in a safe area, try walking to your destinations as much as possible). Walking and more intense forms of cardio can be wonderful for jump starting a weight loss journey. But if you stick to JUST cardio, it will be just that and only that: weight loss. Not fat loss. Excessive cardio eats away your muscle, so you want to be careful to not overdo it. Muscle is what you want to keep, and build, in order to actually loose fat. The more muscle you have on your body, the higher your resting metabolism. It’s important to mix up your routine if you’re looking to lose fat rather than maintain your weight. Work on building strength, and the weight will come off (as long as you stick to a healthy diet—trust me, I have personal experience from years of learning that you can never out train a bad diet! Fat loss starts in the kitchen). Next week, we will go a little deeper in proper exercise and nutrition as well as touch on another important, but often neglected factor in healthy weight and lifestyle. Happy New Year, everyone! As we enter 2019, most of us have goals of renewing ourselves and refocusing on our health- whether that’s mental or physical. Along with those goals may be a big one: quitting tobacco or continuing to reduce your tobacco use as we enter the New Year. 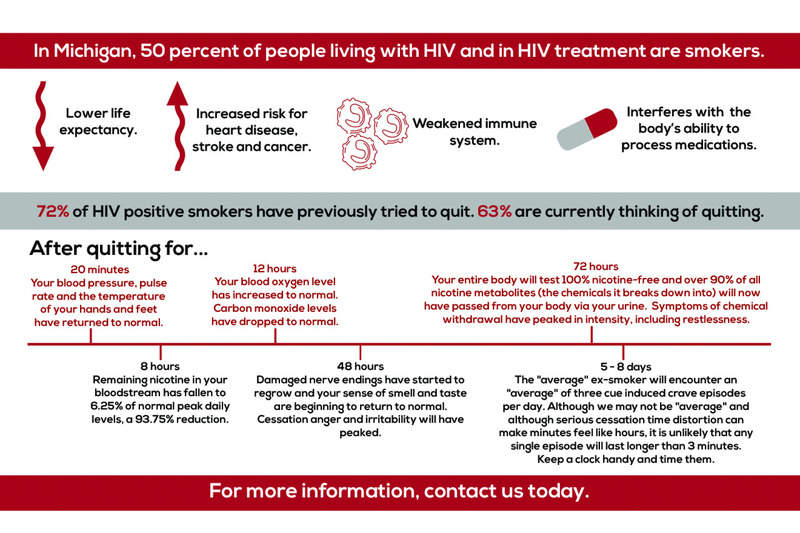 Whether you have never quit before, or have been quitting for the past year, the Tobacco Treatment Specialists at UNIFIED want to help you quit and stay tobacco free- whatever that looks like in your life! You may be wondering “Do I qualify for these FREE services, and if so, what exactly do these services provide?” To qualify for the Tobacco Reduction Program at UNIFIED you need to be an individual living with HIV/AIDS, qualify as low-income and live in either the Detroit, Ypsilanti or Jackson area. If you have never received case management services with UNIFIED before but fit the above qualifications, you still qualify for these FREE tobacco cessation services! So what does a tobacco reduction counseling session consist of, anyways? The short of it, is that it is different for everyone and up to you what you want your reduction and quit plan looks like. We, as tobacco cessation counselors, are here to offer proven-strategies, non-judgmental support and accurate information to help guide your journey to a successful smoke-free life. When I meet with my clients, I think of it as them driving the car and me simply navigating the route for them. Most smokers know what they need to do to quit, but need a little guidance to create an individual and effective game plan to get there. That’s where Tobacco Treatment Specialists come in! Not ready to quit or reduce, but a little concerned about the health, social or personal implications of tobacco use? Come talk to a cessation counselor! We respect the boundaries of our clients and don’t push when an individual is not ready to make this big change. What we will do is offer information when appropriate, have open conversations about the pros and cons of smoking, and help you decide if it is the right time in your life to quit and give real feedback on what tools (mental coping strategies) you will need when you decide you’re ready to work towards reducing or setting a quit date. There’s nothing to lose by speaking with a tobacco cessation counselor, except maybe a pack of cigarettes or two! Give us a call today! For our Detroit location, reach Amber Jager at (313)446-9817 and for our Ypsilanti and Jackson location, reach Erin Suprunuk at (734)572-9355. Quitting smoking can momentarily bring on a more depressed mood as your body adjusts its hormone balance and the nicotine receptors slowly start to decrease back to a normal level. Think of it this way- when you smoke a cigarette, nicotine attaches to naturally occurring receptors in your brain. When this happens, you get a flood of dopamine (the feel good hormone). As time goes on and your smoking becomes a habit, your brain develops even more receptors allowing more nicotine to bind to receptors, resulting in a huge flood of dopamine. Well, your brain is not used to having this much dopamine readily available and down regulates this amount. Think of it as you listening to uncomfortably loud music and putting earplugs in to lessen what you can hear (Sleight, VJ. (2016, September 18) A craving is just your brain screaming, “WHERE’S MY NICOTINE?” Retrieved from https://www.linkedin.com/pulse/craving-just-your-brain-screaming-wheres-my-nicotine-vj/). This is what your brain does with dopamine. Once you stop smoking, your brain will take a while (a few weeks usually) to adjust to the lessened amount of dopamine that is being produced. Your brain is still down regulating the amount of dopamine being produced, leading to even less dopamine being processed in your brain than before you started smoking. So, you’ve turned the music down but you haven’t taken the earplugs out yet (Sleight, VJ.). The time it takes is different for everyone’s brain to adjust to the normal hormone levels now being produced (some only days, some up to a few weeks) and this could by why some people experience depressed symptoms after quitting tobacco use and some do not. It could also be the reason for increased agitation and feelings of anxiety as part of the withdrawals. Also, as we dive into the winter season in Michigan we need to be aware that seasonal depression is among us. Up to 10% of adults will experience SAD, Seasonal Affective Disorder (Mental Health America, http://www.mentalhealthamerica.net/conditions/sad). Savor the moment. This could be any moment- having dinner with a friend, talking with a loved one, walking outside, etc. Savor it by being completely present in this moment- no thoughts of the past or future, electronics put away, thoughts on what you feel, see and hear in that moment. Be kind to someone. This could be someone that you know, or a complete stranger. But the idea is to act with kindness without expecting anything in return. Open the door for someone, smile at a stranger, give someone a compliment. Spend less money on things and more on experiences (but free experiences are an added bonus). We get used to and bored with things. Experiences are encoded as memories that we can cherish forever, and they foster personal growth. Make a new social connection or strengthen a friendship that you currently have. Say hi to a stranger, call a friend that you haven’t spoken to in a while, check-in on your neighbor. These are just a few! I encourage you to do some of your own research, try out new things and see what works for you to lessen the seasonal blues. I strongly believe in taking care of your mental health and reaching the highest potential as possible regarding your happiness– we all deserve it! If you would like to work on more specific coping mechanisms with a smoking cessation counselor one on one to develop an individualized approach with tangible resources to help you quit with less distress, reach out to Amber Jager at (313)446-9817 for persons living in the Detroit area, and Erin Suprunk at (734)961-1077 for persons living in the Ypsilanti and Jackson area to see if you qualify for FREE smoking cessation services! Please take into consideration that the combination of these activities are meant to be a part of lifestyle changes in order to help increase general happiness and fight off mild feelings of depression, but are in no means meant to treat Major Depressive Disorder or other extreme conditions that need to be treated by a physician. If you are experiencing suicidal thoughts or experiencing extreme or worsening depression, call the National Suicide Prevention Hotline at 1-800-273-8255. The Lifeline provides 24/7, free and confidential support for people in distress, and prevention and crisis resources for you or your loved ones. A session with the tobacco treatment specialists is different for everybody. We meet you wherever you’re at and will continue to be there for you every step of the way. It all starts with a referral from your case manager. At each visit, they will ask about your tobacco use and assess your readiness to quit. 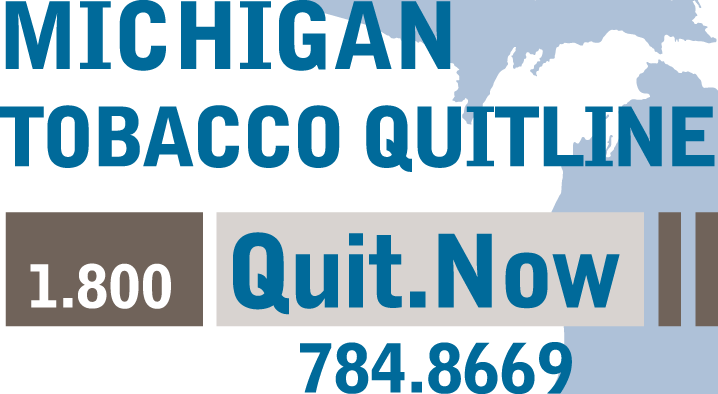 If you both decide that you are a good candidate for the tobacco program, the case manager will fill out a referral form with you and give it to the tobacco treatment specialists (TTS). So how is your readiness to quit determined? Through The FIVE A’s; ask, advise, assess, assist, and arrange. Ask- Your case manager is required to ask every client about their tobacco use at each visit and record it in our records. Advise- If the client answered that they were a tobacco user, then the case manager will advise them to quit their tobacco use and discuss the benefits of doing so. Assess- Next, the case manager will assess the clients willingness and readiness to make a quit attempt. If the client is interested in talking to the TTS about tobacco reduction, the case manager will then make the referral to the tobacco treatment specialist. In some cases the case manager will refer the client, with the client’s consent, to the TTS before they are considered “ready” in order to get the client thinking about quitting and to help establish the relationship between the client and the tobacco treatment specialist. Assist- At this point, the case manager and the tobacco treatment specialist have touched base and the client is now being assisted by completing sessions with the TTS. During the sessions, the client and TTS will discuss reduction strategies and possible nicotine replacement therapy options. These sessions can go many ways depending on the clients needs. Some clients need to talk about outside sources that are affecting their tobacco use, while others simply want information on tobacco and health. Arrange- The TTS will arrange follow-ups with the client. Depending on the clients stage of change and the client’s schedule, the TTS will likely meet weekly or biweekly with the client. These follow-ups can be by phone or in person. In some instances, the TTS will also meet the client at their home or a local business. This is the point in the treatment where the TTS tries to meet the client wherever is easiest for them in order to help make the client more successful in their quit attempt. The transtheoretical model is a behavior change model that was specifically created with tobacco cessation in mind. 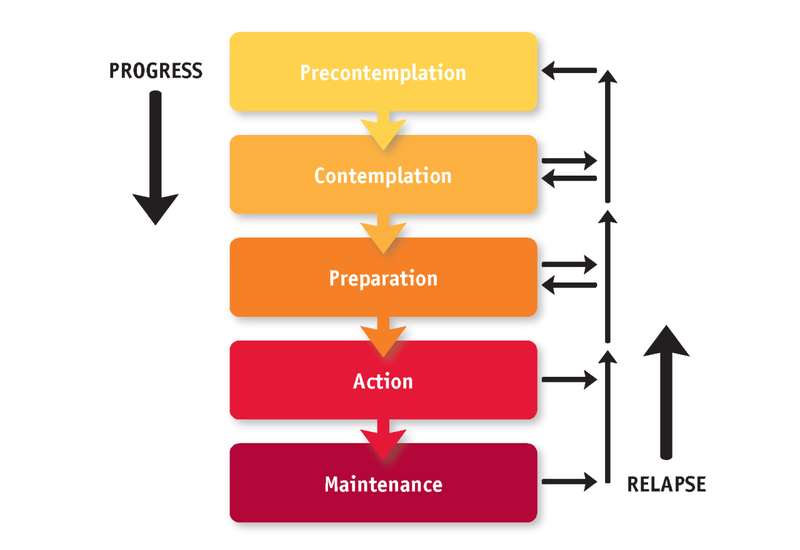 The 5 stages of change are precontemplation, contemplation, preparation, action, and maintenance. It is important to know that the stages of change are not linear (that they don’t go in a single straight order). Someone can go from being in action to contemplation in an instance. Precontemplation- the client is not ready to quit or is not even considered quitting. Contemplation- the client is considering quitting in the next 6 months. Preparation- the client is ready to quit within the next 30 days. Action- the client is currently on their quit attempt. Maintenance- the client has successfully quit for 6 months. Because the transtheoretical model is not linear, a client can attempt to quit many times before being successful. It is important to know that the tobacco treatment specialists are aware that not everyone will be successful right off the bat. The specialists are there to help the client every step of the way in a completely non-judgmental environment. Whether you’ve been working with them for months and relapse, or you met with them once and decided the program isn’t for you, they will always be there for you when you are ready to talk again. Want to learn more about UNIFIED’s tobacco reduction program? Visit us online at http://miunified.org/Get-Help/Services/Tobacco-Reduction-Services for more information.